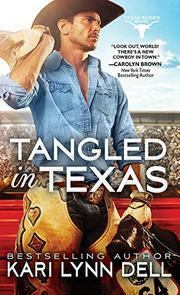 A pro bronc rider gets a second chance with the woman he once lost to his own stubborn pride. Western romances haven’t gotten a lot of attention in the last few years, but Dell’s Texas Rodeo series may change that. In this second installment, Dell (Reckless in Texas, 2016), herself a rancher and rodeo competitor, portrays the setting of the Texas Panhandle and the culture of pro rodeo with brilliantly natural detail. This is a second-chance romance, as Delon Sanchez returns home from the pro bull riding circuit after a devastating knee injury only to find his new physical therapist is an old girlfriend. Victoria, the daughter of a U.S. senator, is attempting to restart her life after leaving Wyoming, where her husband died in a tragic accident. Victoria’s life away from Texas helped her shed her “Panhandle Princess” persona and mature into a stronger and wiser, if more cautious, woman. Delon is struggling to cope with the possible end of his career: “they should have drawn a chalk outline in the arena where he’d fallen, because the man who’d climbed down into the bucking chute that night was nowhere to be found.” Unfortunately, though the two have a solid friendship to match their still-sizzling attraction, Delon in particular hasn’t learned how to commit. As Tori puts it, " 'Together?' She snorted. ‘Funny. It feels more like I’m sitting in one place again while you circle around, making sure you never get close enough to get burned.' " Tori has her own issues related to her husband’s death and the burden of her family’s fame; she’s a remarkable heroine who deserves a hero to match. Still, while readers may tire of Delon’s immaturity, the payoff when he finally wakes up is achingly sweet. Dell’s ability to immerse her readers in the world of rodeo, coupled with her stellar writing, makes this a contemporary Western not to miss.